Meet Hou Zhenshan. 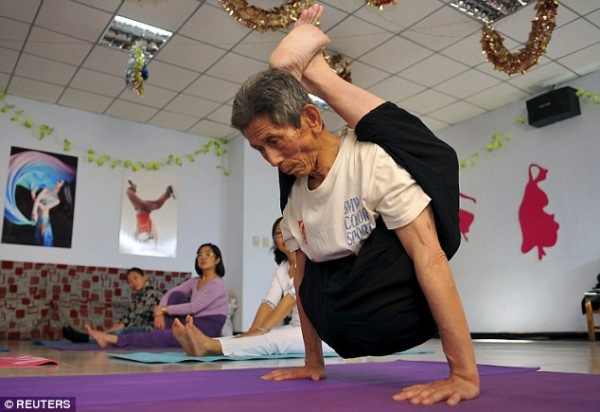 He is an 84-year-old man from China's Xuanhua District, and when it comes to yoga, he's as bendy, open, and inspiring as they come. Having started yoga 30 years ago, Hou Zhenshan found yoga to be a restorative practice which not only improved his general health but his flexibility too. As you see in his amazing photos, he can twist, turn, maneuver, and is even creating his own poses to further his creative practice. As yogis of all ages look to him for an example, Hen Zhenshan truly shows that the process of yoga is an endeavor in health, peace, and discovery. This pensioner's life didn't slow down with his retirement. When he is not developing his own amazing talents and insights on the mat, he is developing this in his community by providing free yoga classes to participants of all ages. Whether 84, 48, or any other age, we can all be encouraged by Hou Zhenshan who is a wonderful sight of physical ability, creative ingenuity, and community engagement. We could all probably take a few pages from his book in the realm of flexibility and physical practice, but even more, his dedication to his practice and his commitment are truly an inspiration. This 84-year-old yogi teaches us that yoga knows no boundaries when it comes to age, practice level, or health. It's for everyone! Where are you going to be when you are 84? Maybe you're already there and sharing your own inspiring story. We'd love to hear your thoughts, admirations, goals, and accomplishments in the comment section!